A very belated New Years greeting for all you of out there. 2011 has been a pretty good year. May the 2012 bring you lots of happiness, good food, and good health. Hands up who has been feasting up a storm during the silly season? I know I’m guilty. Though with the ankle injury it means I had to stay at home more, therefore, missing out some of the parties. Having said that though I have not cooked properly for a few days and has relied on take outs etc. As a result I’m starting to feel a little bloated, and a little sluggish. Time for some healthier meals! We went to the supermarket and filled our fridge with vegetables. And fish. Before the Chinese New Year comes (only 2 weeks more) we will try to eat as green as possible. At the same time cut our alcohol intake down (most important). Once I can walk properly again I’ve got to get back to exercising daily too. 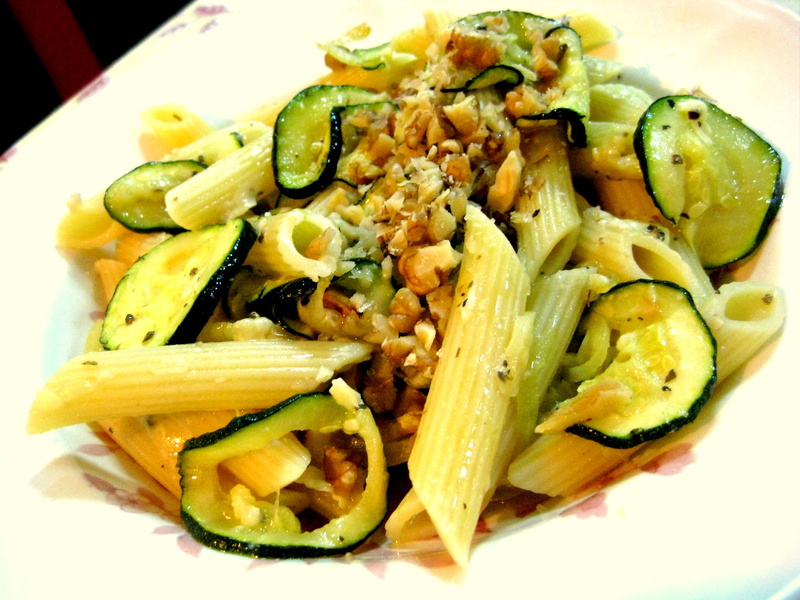 This is another recipe using the very versatile Zucchini. This simple pasta can dressed up with more ingredients you can find in yours fridge, though already perfect on its own. I dressed mine up with Truffle oil. Good for a summer picnic, or a weeknight dinner. 2. Toss zucchini, onion, garlic with 2 tablespoons of olive oil in a bowl, season with salt and pepper. Spread the mixture on parchment paper and roast until zucchini is lightly browned, turning once, about 20 minutes. 3. Prepare the pasta according to the package directions. Drained the pasta, reserving just a small amount of liquid and add the rest of the olive oil. Set aside. 4. Stir the roasted vegetables into the pasta. Turn on small heat so the pasta doesn’t get too cold when you serve. Add basil and cheese and mix well. 5. Turn off the heat and squeeze lemon juice over. When serving sprinkle walnuts on top and add a dash of truffle oil. Feel free to add things like eggplants, sun-dried tomatoes, olives or even chili. If you can’t absolutely can’t do vegetarian, add crispy bacon, or Chorizo sausages, or salmon. For a vegan version omit the cheese. Serve immediately. Or eat cold like a salad. It’s versatile enough. 1. Get a new camera for this blog. Suggestions welcome. 2. Eat vegan or vegatarian for a week at least every 2 months. And support Meat Free Monday. 3. Make more desserts because life is too short. Bake more. Take on more complicated projects. 4. Host more dinner parties at home. Helps me to become less socially awkward. 5. Work towards either a catering business or a restaurant. I give myself 5 years time for this. Now time to plan my healthy meals for the rest of the week! Feel free to throw in some recipe suggestions. Pan Fried Salmon with Lemon Mustard Sauce, Potato Galette and Green Beans. This was so superb. Simple. But perfect. It ruled. Why wait five years to set up your own restaurant when you can do it sooner? 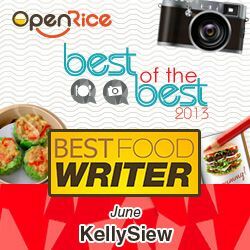 Your cooking’s better than many in KL. It worked nicely, slept like a baby after it. Good work. Gotta achieve other goals first. You know what. 🙂 This is less important so the time limit is longer. Btw I know you do the Lemon Detox Diet which i tried once but got really sick any suggestions on how to do it safely? hey thanks Kelly 🙂 Maybe i’ll give that a go and just try eating vegetarian meals at night for a week. I’ve heard some really good reviews but last time I did it…I was so ill for such a long time… 😦 do you put the weight back on pretty quickly? Daisy: The weight stays off for a while if you continue to eat healthy. The main thing is too get rid of the yuckies from your body anyway. Weight loss is just a bonus. Great 🙂 definitely going to give this a try when I go back to Melb ~ Thanks a bunch!